The most famous edible wild plant in eastern US?! Possibly! 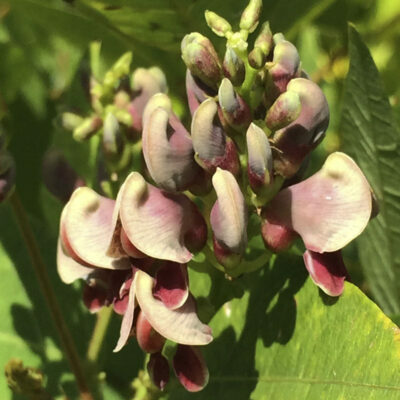 Fragrant maroon and cream-colored flowers shaped like pea blossoms grow on vines with long green leaves all summer. A staple in Native American diets: almost every part is edible—shoots, flowers, seeds in pods, bulb-like tubers that grow on roots. Mild-tasting tubers are a good source of protein. Not the common peanut. Prominent in colonial history and American literature. Excellent health benefits are associated with Groundnut as well. Full-part sun. Height 15-20′. Native. Zones 4-8.